World-leading breast imaging technology by a Wellington-based tech firm and an app helping clinicians’ reduce paperwork were the big winners at this year’s NZ Health IT Awards. A Wellington tech firm’s breast imaging innovation – currently being trialled by UK’s NHS – took out the International Health IT solution category in the 2018 NZ Health IT Award. The award to Volpara Health Technology was announced yesterday by Scott Arrol, CEO of NZ Health IT (NZHIT) during the opening of the HiNZ Conference in Wellington. The New Zealand Health IT Solution category went to Sense Medical for the Cortex app and platform that has been successfully trialled by clinicians at Christchurch Hospital that allows clinical notes to be taken at the bedside, diagnostic tests ordered, test results notified and accessed, and clinical observations viewed. Arrol said this year’s awards had received a huge response with 25 high calibre entries being received of a very high standard with judges commenting on the high level of innovations across all entries. Volpara’s breast imaging ‘Volpara Density’ software helps with the early detection of breast cancer and is now operating in 36 countries worldwide including being used for screening of 1 million women in the United States. Earlier this year Volpara also announced that a research project being run by the UK NHS’s Breast Screening Programme was to use Volpara Density software with the aim of improving breast cancer risk prediction of women undergoing routine breast screening. In the two year trial, all consenting women screened for breast cancer in the Greater Manchester, East Cheshire and East Lancashire regions will receive breast cancer risk information based on a risk assessment that includes Volpara Density mammographic density. Cortex is a locally clinician-developed digital platform, by Christchurch-founded firm Sense Medical, that was first trialled in Christchurch Hospital’s general surgical wards last year using iPads and iPhones. By the end of the first month, 97 per cent of acute admission notes were being done on Cortex, 5,400 bedside notes had been recorded, 2,000 test orders made and 3,900 tasks assigned via Cortex. The trial showed Cortex contributed to a marked reduction in the length of stays on the wards and in read missions. The International category finalists were Ablex Healthcare (digital therapy for neurological disability) and Sysmex New Zealand (Sysmex Delphic LIS). 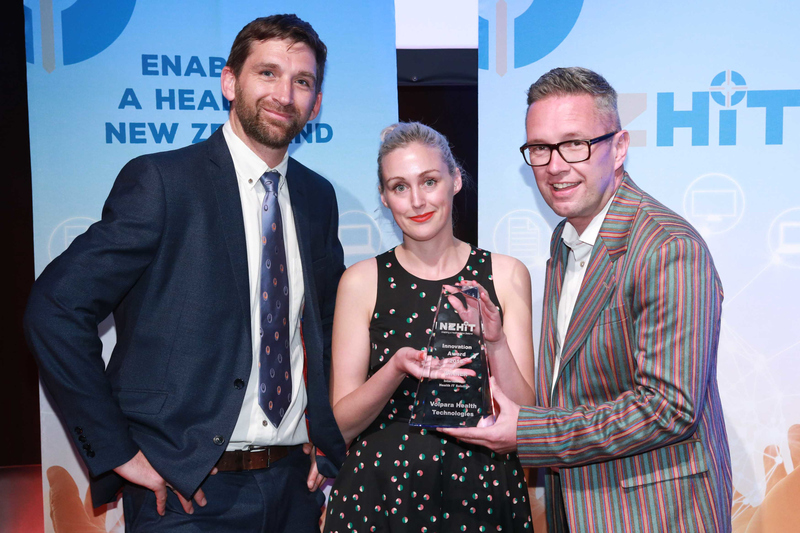 The NZHIT Innovation Awards were this year handed over by international keynote speaker, Richard Corbridge who is the Chief Digital & Information Officer at Leeds Teaching Hospitals Trust in the United Kingdom. NZHIT launched the innovation awards programme three years ago showcase the Kiwi digital solutions developed to enable enhanced delivery of healthcare services. Arrol said that the Awards had gone from strength to strength each year. “There is no doubt that NZHIT members are leading the way in the solutions being developed through a collaborative approach with clinicians and care providers, we’re seeing a wave of highly innovative thinking and development of health IT solutions that are making a positive impact on the health and wellbeing of citizens nationally and globally”.